The season of being grateful for all we have and giving to others in need is upon us. Are you looking for ways to get your preschooler or young child involved with giving back? Today, we are going to share some easy ways that you can get your little one in the giving spirit — not only this holiday season, but year-round. Why do people give? One of the most common reasons people give back is because it is a way for people to show their gratitude. Before you request for your child to give away their belongings or help pick up trash in the neighborhood park, first have a discussion with your child about gratitude and the reason behind the act of giving. When your child experiences the feeling of gratitude for themselves and has a deeper understanding of the importance of giving back, they will be more willing to give back themselves. A great way for preschool-aged children to give back is by donating their belongings, such as toys and clothes. This is a great first-hand opportunity for your little one to recognize that there are other children who are less fortunate than them who they can help. While it may be difficult for your child to part with their belongings, help show them that the good feeling of making another child’s life better far exceeds keeping any toys or clothing they want to hold onto. Does a neighbor need help getting their mail? Bringing in their recycling bins? Or helping bring in groceries? Talk to your neighbor and see if there are any tasks that your child can help them with. 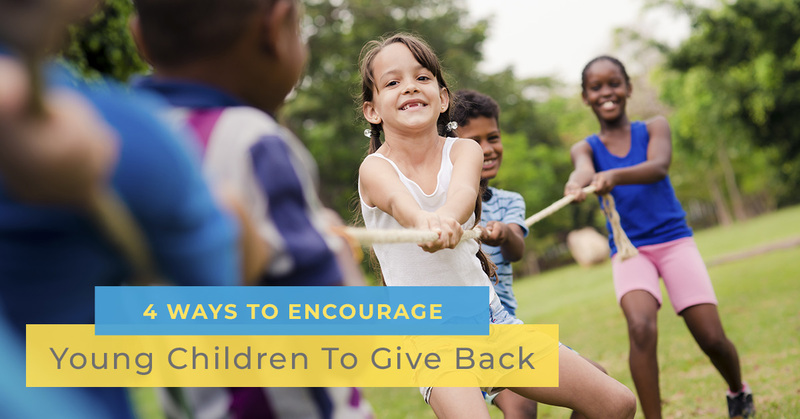 Not only will this encourage your child to give back to others, but it will also teach them how to be a good neighbor. When you bake for a family in need, don’t forget to involve your preschooler. Explain to your child how this meal is helping a family and let them help by getting the ingredients, measuring, and mixing. Have you been noticing a lot of trash laying around at the neighborhood park? Teach your child that giving back can also be through acts of service, such as cleaning up trash around the community. Throw on some gloves, grab a trash bag, and see how much trash you and your child can find. Really drive the message of giving home by surrounding your child with people, books, and other influences who model and encourage them to give back. By looking up to positive influences who encourage this behavior, you will be surprised by the actions that result from it. Follow these preschool learning tips to encourage your young child to give back and watch as their compassion and generosity grows. Are you looking to enroll your child in preschool? Or are you looking for before and after school care? Check out our programs at Kidstown Learning Center in Fort Worth today.